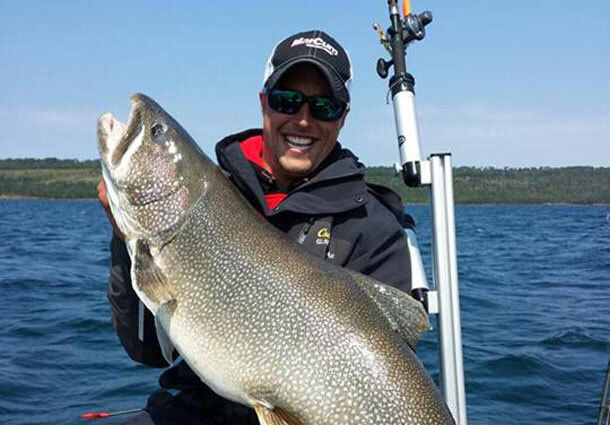 THUNDER BAY – When you see the giant lake trout that Grant Sorensen and James Holst have been catching on Lake Superior, that line from Jaws might enter your mind – “We need a bigger boat.” But you don’t. Rather, you need a better line. You need Sufix 832 Advanced Lead Core line. Sorensen began experimenting with Sufix 832 Advanced Lead Core two years ago with Holst, a fellow Rapala pro-staffer and In-Depth Outdoors TV’s host. Last fall, they caught several 30-plus-pound lake trout on Lake Superior while filming this In-Depth Outdoors TV show. In mid-August this year, Sorensen reeled in (and Holst netted) a fat, 44-inch Lake Superior laker. In addition to the lead core line, Holst and Sorensen’s lake trout set-up comprises multiple long rods, big spoons, planer boards and snap sinkers. It does not require cost-prohibitive equipment. Superior trends are “evolving away from the giant charter boats, monster ocean rods and reels and super heavy tackle,” Holst says. “People who don’t have – or don’t enjoy using – super-heavy equipment can use Sufix 832 Advanced Lead Core to catch trophy-size lake trout out of their walleye boats, on their walleye gear. “Catching giants is now less intimidating, more affordable, more enjoyable,” Holst says. 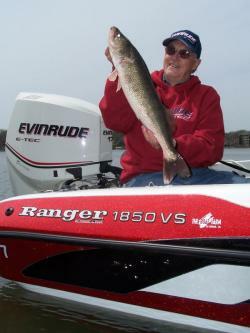 Sorensen caught his 44-inch laker out of Holst’s 20-foot, 4-inch Skeeter MX 2025. But you don’t need a 20-plus-foot boat to get on this bite. In the summer and fall, avoid east or south winds, Sorensen advises. In the spring, watch out for west winds. He relies on web-published weather information from The National Oceanic and Atmospheric Administration (NOAA) and the Coast Guard. “They all put out good, reliable weather reports, so you can take a look at the winds and map your plan for the day,” Sorensen says. Many good lake trout spots on Lake Superior are close to shore. 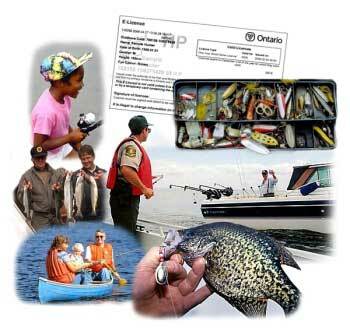 Anglers can enjoy much stable water and many calm days most of the summer and into early September. Late September and much of October is pretty stable too, but chillier. “You’ll definitely be able to fish in those conditions,” Sorensen says. Sorensen and Holst’s giant lake trout program will look familiar to many anglers across the Upper Midwest. 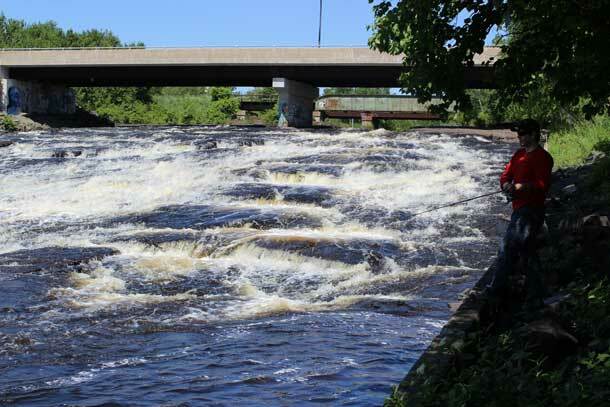 Sorensen and Holst troll in a gradual zig zag pattern, covering 10 to 80 feet of water. “That’s really hard to do with downriggers,” Sorensen notes. “That’s what makes Sufix 832 Advanced Lead Core so productive.” Lake Superior’s biggest lake trout seem to prefer the top 40 feet of the water column. “With the 832 Advanced, we’re able to fish shallow lines, which is where we’re finding the biggest fish,” Holst explains. In the last three years, of all Sorensen and Holsts’ catches heavier than 18 pounds have come shallower than 40 feet. And several of those weighed 25 to 35 pounds. Both Holst and Sorensen are convinced that traditional lake trout tactics scare away the bigger fish, which often suspend less than 60 feet deep. Baits presented on fluorocarbon leaders tied to Sufix 832 Advanced Lead Core, however, pull right through the strike zone without the need for a bulky downrigger. Although both Sorensen and Holst have caught numerous 20-plus-pound lake trout and several heftier than 30 pounds, the 44-incher Holst netted for Sorensen this August impressed even these two seasoned anglers. And although Sorensen works out with weights four times a week and is in great shape at 23 years old, he struggled to hold up the beast. “It was just a truly amazing fish, one that most people probably wouldn’t even believe exists in Lake Superior,” Holst says. Although the fish appeared big enough to challenge Minnesota’s lake trout state record of 43 pounds, 8 ounces, neither Sorensen nor Holst wanted to undergo a weighing and certification process that would certainly lead to the fish’s demise. After measuring the fish (but not weighing her; they did not have a scale onboard), Sorensen and Holst teamed to revive it boatside, one supporting it head, the other its tail.